NETWORK FINALS: SPEECHLESS gained 0.1 in final numbers. CABLE HIGHLIGHTS: ESPN’s NBA doubleheader led Wednesday cable at 0.74/0.69. VH1’s BLACK INK CREW dropped 0.09 to 0.65. On History, VIKINGS gained 0.02 to 0.54, and KNIGHTFALL ticked down to 0.23. Bravo’s REAL HOUSEWIVES OF NEW JERSEY dipped 0.02 to 0.49. On TLC, a regular episode of MY 600-LB LIFE was up 0.19 from last week’s special to 0.48, and FAMILY BY THE TON premiered at 0.36. MTV’s CATFISH rose 0.08 to 0.38. MSNBC’s RACHEL MADDOW SHOW again led cable news with 0.38/0.57/3.1M, over Fox News’s TUCKER CARLSON TONIGHT at 0.33/0.49/2.7M, and CNN’s ERIN BURNETT OUTFRONT at 0.21/0.26/900K. OWN’s IF LOVING YOU IS WRONG returned at 0.36. 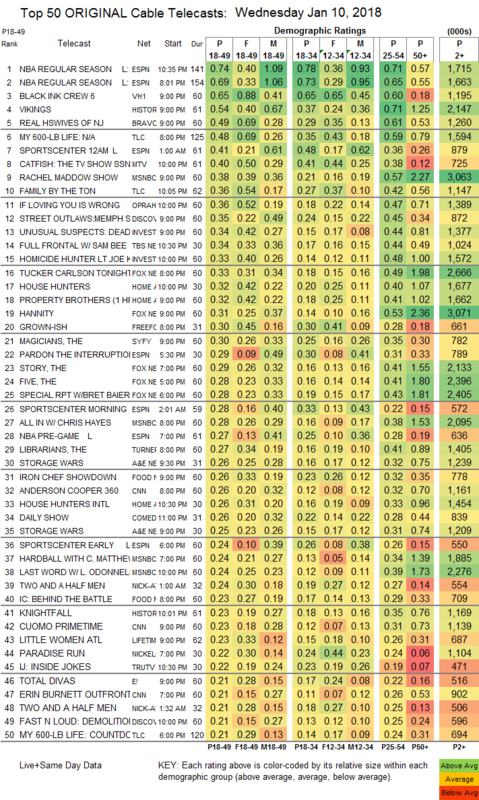 On Discovery, a STREET OUTLAWS special was up 0.03 from last week’s special, and FAST N LOUD was up 0.03 to 0.21. On ID, UNUSUAL SUSPECTS returned at 0.34, and lead-out HOMICIDE HUNTER was at 0.33. TBS’s FULL FRONTAL (which just received a 2-year renewal) returned at 0.34. On HGTV, HOUSE HUNTERS dropped 0.04 to 0.32, PROPERTY BROTHERS lost 0.06 to 0.32, and HOUSE HUNTERS INTL was down 0.04 to 0.26. On Freeform, GROWN-ISH dropped to 0.30 from last week’s 0.40/0.39 premiere, and ALONE TOGETHER premiered at 0.17. 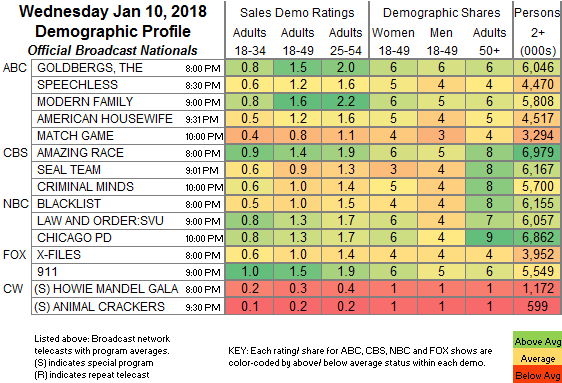 On Syfy, the season premiere of THE MAGICIANS dropped a heavy 0.22 from the 2017 premiere to 0.30, and HAPPY returned from a week off down 0.04 to 0.18. TNT’s THE LIBRARIANS ticked up to 0.27. On A&E, STORAGE WARS was at 0.26/0.25, and ROOSTER & BUTCH premiered at 0.14. On Food Network, IRON CHEF SHOWDOWN climbed 0.03 to 0.26, and IRON CHEF BEHIND THE BATTLE ticked up to 0.23. On Lifetime, LITTLE WOMEN: ATLANTA fell 0.09 to 0.23, and TERRA’S BIG HOUSE was down 0.07 to 0.15. On E!, TOTAL DIVAS dropped 0.08 to 0.21, and WAGS returned at 0.14.